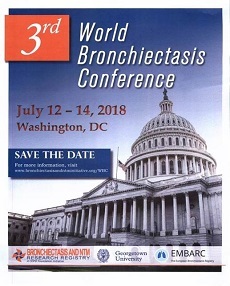 Up to now, only a few controlled studies have been performed, so that hardly any evidence-based recommendations could be submitted for non-CF bronchiectasis. At the present time, the efficacy of many different substances is being tested. A hypertonic saline solution is often used clinically as it has been shown to be effective in CF, although this has not yet been documented for non-CF bronchiectasis. After good results in the Phase II studies, inhalational mannitol is now in Phase III clinical trials. Inhalational antibiotics could be of importance, particularly in patients populated with gram-negative bacteria. Tobramycin and colistin are well established – though not registered - aztreonam, ciprofloxacin and gentamicin are being tested in clinical studies. Macrolides, however, according to the results of several studies with only small sample size, seem to have an additional effect. Long-term therapy with inhalational antibiotics and/or macrolides is only indicated if a clearly positive effect (decreased amount of sputum, no exacerbation) is achieved within three months from start of therapy.